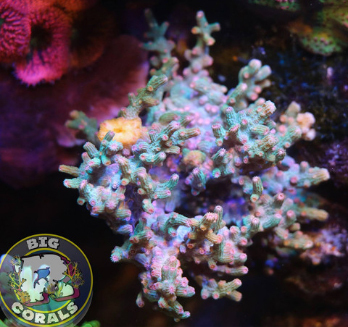 This weeks AquaNerd Featured Coral of the Week comes to us from Mike Biggar at Big R Corals. 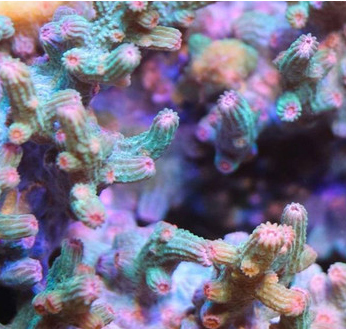 Mike has been in business servicing tanks and selling corals online and to his clients for about 10 years and he seeks out the best corals that look healthy and attractive but also grow well in captivity for his customers to appreciate. The coral pictured above is the Aqua Branching Cyphastrea (Cy-fas-tree-a). 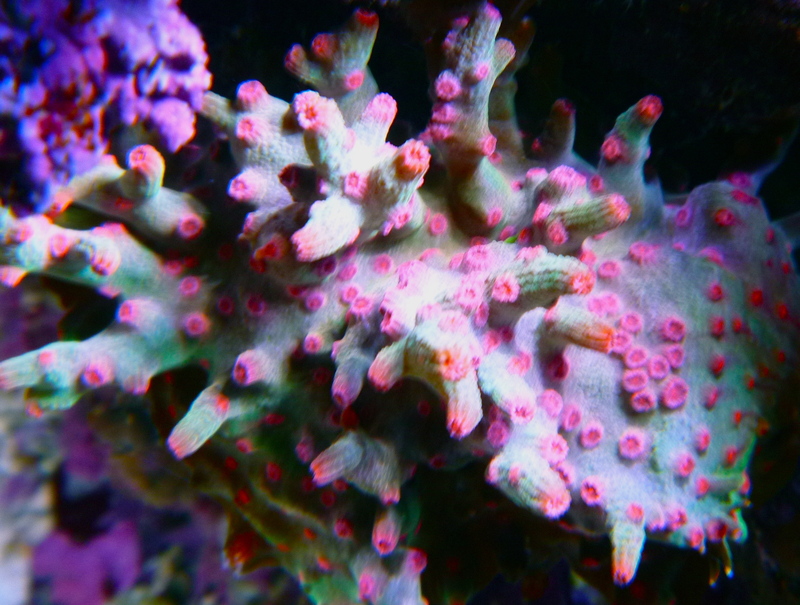 This SPS coral is a branching variety of the more commonly found encrusting variety of Cyphastrea we typically see in the hobby. Generally considered to be an SPS coral by many aquarists because of it’s small polyp size, it’s actually a member of the Faviidae family. If you asked most aquarists, they would tell you that Faviidae corals are LPS corals. So in terms of scientific classification, SPS and LPS really don’t identify corals or mean much, if anything, to the scientific community. But none the less, for aquarists, it’s an SPS coral. All species, with the exception of C. decadia which is arborescent with axial and radial corallites, are massive or encrusting. Corallites are plocoid (each corallite has its own wall separate from neighboring corallites) with calices less than 3 mm in diameter. Costae are generally restricted to the corallite wall; the coenosteum is granulated. Polyps are extended only at night (Veron, 1986). Mike’s Aqua Branching Cyphastrea looks similar, if not identical to Tyree’s LE Ctphastrea decadia show in the picture below. The C. decadia looks similar in appearance to certain Acropora corals as their polyps are on the end of a branch. These corallites, though small, are very attractive. Being so small they often have a ‘fuzzy’ appearance, but with close inspection you can see that they are actually star-like. This is because they have 10 to 12 tiny ridges on the outside wall of the corallite, known as costae, which gives them this starry appearance. Also because of their small size, they will sometimes be called a small polyp stony (SPS) coral rather than a large polyp stony (LPS) coral like the majority of the corals in the Faviidae family. Depth range based on 3168 specimens in 21 taxa. Water temperature and chemistry ranges based on 2814 samples. The Lesser Knob Coral is considered to be a fairly hardy coral and thus, in general is moderate to easy to care in a reef aquarium. They like a moderate water movement with moderate to low lighting. Like other members of the Faviidae family, the polyps come out at night. They can be fed small foods like rotifers, newly hatched brine shrimp, mysis, zooplankton type foods, and other foods for filter feeders. C. decadia is said to prefer lower lighting, and If your lighting is lower they should be fed more often.